A Summer Cottage is a stylish, modern holiday house in Byron Bay that will have you returning year after year. Freshly renovated, this light filled oasis is set on a quiet lane, yet only a stroll to main street. Make your beach holiday complete and book in surf lessons or sea kayaking! Views from Cape Byron lighthouse are not to be missed! Sunseekers will love the 5-minute stroll to Clarkes Beach, the lighthouse walking tracks and Tallows Beach. Live like a local with The Top Shop just around the corner for your caffeine fix. This recently renovated three-bedroom comfortably sleeps 6 people in style, and there’s plenty of room to entertain with brand new well-equipped kitchen, spacious covered deck and Bose music system. Friends and family will enjoy entertaining in this coastal cool paradise. The house faces north to catch the sun and the cooling breeze. No cancellations permitted. We will endeavour to rebook your dates if at all possible. If we can rebook your dates for the same rate then we will refund you your deposit less a $100 cancellation fee. If we need to discount to rebook your dates then we will refund your deposit less the difference between the rates and a $100 cancellation fee. A Security deposit of $1000.00 is payable prior to check in arranged with the property managers prior to arrival. 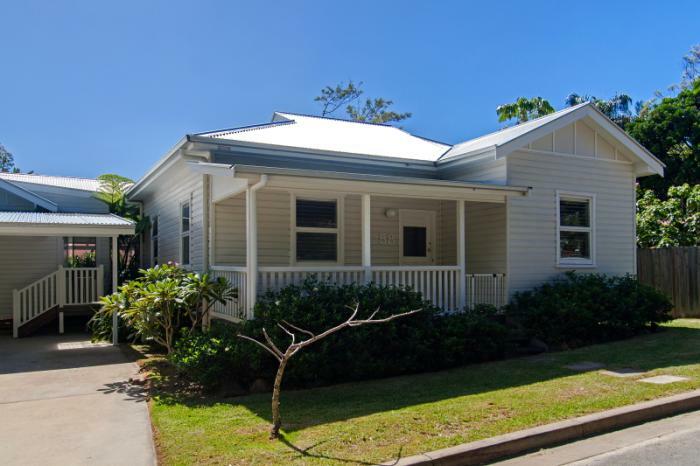 Please note this property does not accept schoolies bookings. No party groups. Family groups only. Fees and eviction can apply for security call-outs (in response to the noisy neighbour hotline). Terms & conditions apply. Christmas and New Year Bookings: if dates include both Christmas Day and New Years Eve a 12 night min stay applies. Three Bedroom House consisting of a Queen, a second king or two large singles, and a pair of singles, to sleep 6. The kitchen is brand new and well equipped - there is a nesspresso machine and several complimentory starter pods. There are a selection of books, magazines, games, and childrens equipment for everyones enjoyment.